Golden Bay offers a variety of fantastic and easily accessible photography locations. During this tour, you will spend three days photographing stunning limestone formations, lush native forests and ever-changing sand dunes on beautiful beaches that the area is famous for. You will have the chance to photograph iconic locations at sunrise and sunset on a 3-day tour that can be customised to suit your photography requirements. This three day private Golden Bay tour allows for a flexible itinerary with options to explore the Abel Tasman National park by boat or take a scenic flight* It is designed around your photographic objectives, the time of the year and your travel itinerary. The tour price is for one or two people based on a twin share/double room. Meet in Nelson mid-morning and drive over to our accommodation in Golden Bay. There are plenty of photo opportunities along the drive so we might stop off or take a short diversion to make the most of the travel time. Our first day finishes with a sunset shoot at one of many stunning beaches in Golden Bay. Our second day commences with an early start to shoot the iconic Abel Tasman National Park at sunrise. We will spend the morning photographing this area before heading to a nearby cafe for a late breakfast. 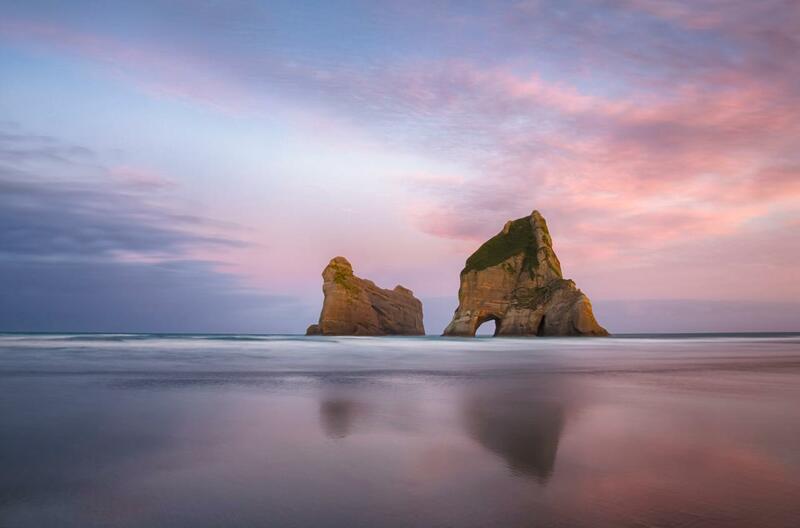 In the afternoon we will head out to Wharariki Beach to photograph Archway Islands at sunset. Our last chance for a sunrise shoot in Golden Bay so we will be up early to shoot one of a number of coastal locations at sunrise. If you would like to do some aerial photography, there is an opportunity to take a scenic flight (on demand and not included in the listed price). We then head inland to the Takaka Hill area to photograph limestone formations and beech forests before making our way back to Nelson to connect with late afternoon flights.